How much do the computer lessons cost? See the Prices page for more details and special offers. It’s up to you! Whether you just want to learn about one thing, or a dozen things, we can sit together at your computer, tablet or phone and go through each one step by step. You tell me what you’d like to know, and I’ll help you understand how to do it in plain English. No jargon, guaranteed! Do I need to sign up for a number of lessons? No. You can have a ‘one-off’ session, or you can book more sessions as and when you want them. Payment is accepted by cash, cheque or bank transfer payable in advance or at the end of each session. My youngest customer was 13 and my oldest was 92. So it really doesn’t matter how old you are! I am very patient and will work with you at your own pace. Lessons usually last for one hour, but can be longer if you wish. Lessons can usually be booked Monday to Friday between 9am and 6pm. A minimum session of 2, 4 or 6 hours may apply - see the Prices page for more details. Does it matter what computer, phone or tablet I have? No, not usually. I can teach on any desktop or laptop computer that is using Microsoft Windows (Windows 10, Windows 8, Windows 7, Vista, XP etc). I can also teach on iPads, tablets, smartphones (Android or Apple), iPhones or Macbooks. 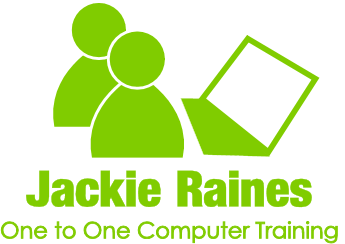 Usually, we will use your own equipment but I can bring a training laptop to the session if required. No. But I can help you use your computer if you are having problems and show you how to ‘clean it up’ and create extra memory space. I can also help you set up your new computer. For mechanical problems or virus problems, I can advise on where to find a local computer shop that can help (Thanet only). Computer language often makes no sense to the ‘learner driver’ and for many it is hard to know where to start. So let me help you find your way around this mysterious machine. Many of my customers are absolute beginners so I understand how nervous some people can feel around technology. I am very patient and I don’t use jargon; I will help you gain the confidence you need to get the best from your computer, tablet or phone. Whether you have an iPad, tablet, smartphone, laptop or traditional desktop computer, whether it’s old or new, I can help you learn the things you need in a relaxed, friendly way. Learn without even leaving the house! Learning at home in familiar surroundings is a great way to relax and enjoy the sessions. Of course, if you don’t drive or you have mobility issues, lessons at home can be advantageous for you too. If you are having a lesson at home, training is done using your own computer, tablet, smartphone and internet service and for the most part, you will be in the driving seat! Lessons are tailored around your needs so if there’s only one or two specific things you want to know, that’s just fine. Take a look at our ‘Things to Learn’ page for other examples of what I can help you with. Tuition can be booked in one, two, four or six hour slots. See our Prices page for details (minimum booking times apply in some areas).